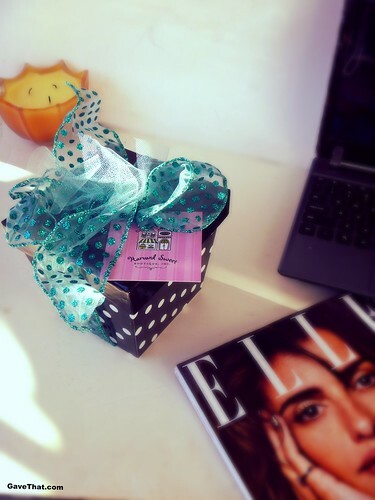 Who wouldn't want to come in and find this waiting for them on their desk!? 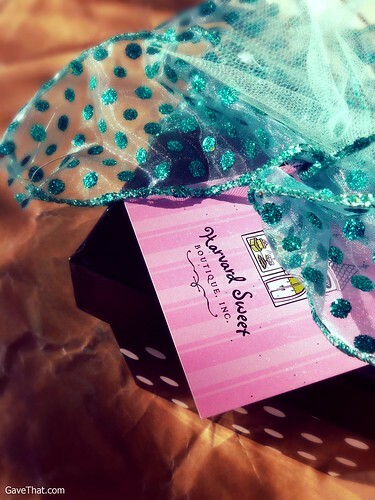 This polka dot gift box arrived recently from Harvard Sweet Boutique and is way too pretty not to display. Even better is what was nestled inside. 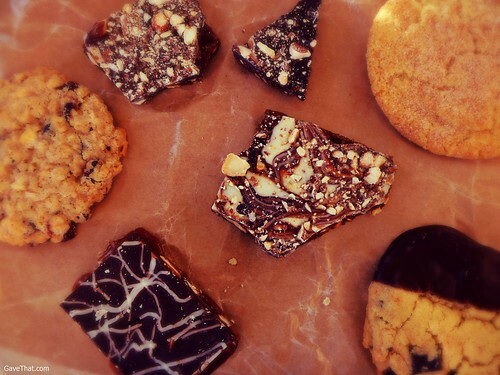 Impeccably packed in blue tissue paper, and not a crumb out of place, were a sampling of the online gourmet bakeries huge cookies and decadent brownies. Even better, these are even gluten-free and low-carb. Since everything is made to order, these came tasting as if they just popped out of the oven. Crisp and filled with large chunks of chocolate, nuts &/or toffee some even boast vanilla sea salt caramel, chili peppers or espresso coffee. One in particular that is out of this world is their chocolate toffee cookies. Think a really thin brownie of ones dreams only in cookie form. Crispy on the outside it's melt in your mouth luscious on the inside. Made even more awesome with crunchy toffee and smooth bittersweet chocolate. Something else equally amazing, their Boston Strong iced cookies with all net proceeds going to The One Fund Boston, Inc. If you're in the Massachusetts visit them at 25 South St., Hudson MA, call 1-888-5-SWEET or you can find them online here. c/o Harvard Sweet Boutique, thank you so much for sending over and making low carb treats!